In the last two years, the Ontario Ministry of Labour (MOL) has increasingly reached out to homeowners, warning them of the dangers of hiring unlicensed, underground trades. This month, they are rolling out two digital advertising campaigns (info) on the topic. They are guaranteed to scare the hell out of consumers, reminding the public that MOL inspectors are out there seven days a week, looking to nab underground operators. And when it comes to roofers, the topic of one of the ads, let’s be honest: the illegal guys are easy to spot. The authorities are right to scare the public. It’s homeowners who dangle cash that are the main culprits in encouraging the underground economy in the first place. With contractors struggling to pay HST, WSIB premiums, comply with the Occupational Health and Safety Act, register with the Ontario College of Trades, and more – no wonder some operators decide to just go underground. But why is it that underground operators STILL get stupid about safety? 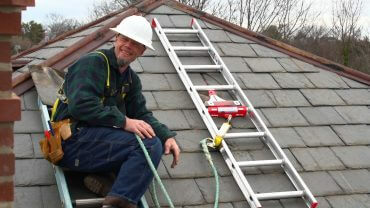 Homeowners continually hire cash roofers who work on their rooftops without a single piece of safety equipment in sight. Most cash operators do not follow current Working at Heights legislation and put their own workers lives in danger for their own profit. The good guys find it a challenge to compete against these types of unscrupulous businesses, needless to say. And yet even the cash guys could actually be safety compliant – at least in terms of equipment, if not the law. That would be strange to see – but logical, in terms of caring about saving lives. Unfortunately the fast buck guys don’t care about human life. Remember that, to be compliant with the new Ontario Working at Heights regulations, you need to take an approved MOL Working at Heights full day course by March 31. We at CARAHS offer the Working at Height course in Toronto and the GTA area. Read what people said about our Ministry of Labour approved course. Do you have a defective vehicle or trailer? Don’t make Smokey Bear’s day!